There's an old saying that Wall Street economists have predicted eight of the last two recessions. The bears in the economics profession keep getting paid a lot of money misreading the nation's economic weather vanes -- whether it was the power and durability of the Reagan expansion in the 1980s, the ferocious bull market of the late 1990s, the after-effects of the 9/11 attacks, or most recently the phenomenal revival of growth in President Donald Trump's first years in office. Most of Wall Street's top economic gurus thought Trump would crash the stock market and the world economy, and here we are with near 4 percent growth over the past six months and a prediction for the year of close to 3.5 percent. That's not a crash. A stopped clock is right twice a day, but the Keynesians on Wall Street are hardly any better than that. All of this is to say the recent frightening claims by Goldman Sachs chief economist Jan Hatzius and other scribes that the economy is likely to slide into recession or a serious skid next year with growth of 1.6 percent to 1.8 percent -- half our current pace -- should be greeted with a collective yawn. Sure, the economy may slip into a recession by 2020. Who knows? The growth rate is cooling down from its blistering 4 percent pace of late. But the last people investors or employers should be listening to are the professional pessimists. Most of these forecasters are relying on a purely Keynesian analysis of the economy and are basing their gloom on the idea of the "sugar high" of the tax cuts and government spending hikes wearing off next year. Just listen to this illogic from the Goldman Sachs report: "tighter financial conditions and a fading fiscal stimulus" from the Trump tax law and $300 billion of new spending will be "key drivers of the deceleration." No. Any move to reduce government spending is a positive for the economy. This is why Trump should veto every spending bill headed his way between now and the 2020 election. 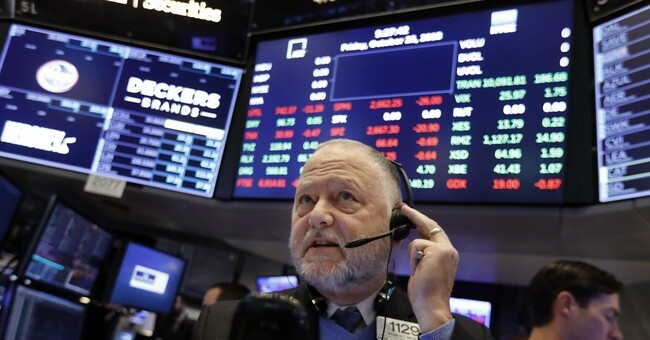 In the 1990s, the economy boomed and the stock market soared even as government spending fell by 3.5 percentage points of GDP, the biggest amount since the end of World War II. The tax cuts aren't primarily consumer-demand focused. The intention and effect of these tax cuts has been to incentivize American businesses to invest, build and hire by increasing their after-tax rates of return on domestic expansions. One impact has been that the United States is sucking capital in from the rest of the world, as reflected in the strength of the dollar. This effect doesn't "wear off;" it is still picking up steam. The United States is simply a better place to invest in today than it was two years ago. Equally flawed is the idea that the economic recovery has been going on for a decade and is now running out of gas. No, the boom began on Nov. 8, 2016, not in 2009. The recovery was anemic in the Obama years. One reason Art Laffer, Larry Kudlow and I were so confident in our predictions to candidate Donald Trump that we could get four or five years of 3 to 4 percent growth was that the recovery from the Great Recession was so flat. We were running $2 trillion a year below trend from a normal recovery. There is still a lot of juice left in this economy. Business investment is up about 7 percent -- notwithstanding the slowdown since August. Admittedly, the trends in the housing sector are worrisome -- thanks in no small part to the Fed rate hikes. Trump is right that the Fed made a major error in its last go-around. The stock market sell-off dates back to the Fed rate hike announcements earlier this fall. The Fed was worried that the economy was growing too quickly at 4 percent. In the 1980s, we had quarters of 8 percent growth and years of above 5 percent growth. This corresponded with lower inflation. For the umpteenth time, Jerome Powell: Growth doesn't cause inflation. Increased output reduces prices. If there is anything good to come of the stock sell-off of recent weeks, it is that the Fed is now much less likely to stay on its path of ill-advised interest-rate hike destruction in 2019. The other big concern is the trade talks with China. This is the unavoidable confrontation with a rogue nation, whose behavior economically, financially and militarily is hostile to the security and economic well-being of the United States. Beijing's abusive trade practices and theft of U.S. intellectual property ($300 billion stolen per year), are intolerable. In the short term, the trade dispute is bad for growth, bad for consumers and bad for stocks. But if/when Trump prevails and gets the concessions from China, the market upside is gigantic. There are a hundred reasons to be optimistic. Oil prices are likely to remain moderate, with gas prices below $3 a gallon, which is a giant tax cut for American consumers and industries. Construction and manufacturing are as strong as they've been in decades. The tax cuts don't start to expire until 2024 -- five years from now. Trump is likely to score more trade victories in the months ahead, thus isolating China and putting more pressure on President Xi Jinping to make a deal. The deregulation agenda under Trump is likely to accelerate in 2019 and 2020 as the one lever the Executive Branch has to clear roadblocks to growth. Wages are rising now for the lowest-income Americans, as The Wall Street Journal recently reported. That should keep consumer spending at a healthy clip. Trump chief economist Larry Kudlow says that "a recession is so far in the distance I can't see it." Nor can I. The only ones who can see it are the Trump haters who want it to happen. Stephen Moore is a senior fellow at The Heritage Foundation and an economic consultant with FreedomWorks. He is the co-author of "Trumponomics: Inside the America First Plan to Revive Our Economy."